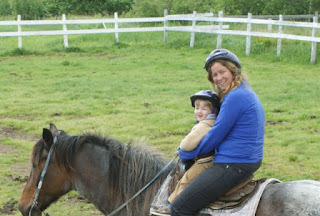 Caleb's Coastal Life: Nieces, horses and trains, oh my! Alan has been away for almost 3 weeks, and last weekend, I needed a break. When my parents mentioned they would be taking Aly and Ava on an overnight trip to Broadleaf Farm, I jumped on the chance to come along. Cale and I packed our bags and hit the road on Saturday morning. I knew my parents wouldn't arrive until suppertime, but I was ready to get out of the house and figured it would be fun to do a Bay of Fundy roadtrip with Cale. The road between Riverview and Fundy National Park is one of my absolute favorites and it felt great to not be in a rush. We made our first stop at the Railroad Museum in Hillsborough. It turned out to be the opening day of the season, so we were greeted by extremely welcoming guides who insisted on giving us a personalized tour. Caleb loved being able to go inside the trains and would have happily stayed at the museum for hours. We arrived at Broadleaf just in time to meet my parents and the girls. Caleb could hardly contain his excitement at the thought of going horseback riding AND spending a night in a cabin with his grandparents and cousins. I was looking forward to a break, and possibly sneaking away for a little alone time, but it turned out that some family time was just what I needed. I had a great time playing and talking with Aly and Ava. They are such incredible girls (and wonderful babysitters) that I just wanted to spend all my time with them. I realized how lucky I am to not only get to be a part of Caleb's life as he grows up, but to also be a part of the lives of my nieces and nephew. I found myself beaming with pride when Ava rode the horse all by herself, laughing to the point of tears at Aly's jokes and ridiculous silly voices, relishing in our girl talk before falling asleep and happily agreeing to get out of bed at 7 am even though Caleb was still in bed. After our wonderful weekend was over, I had a chance to meet another new family member- my 8 week old niece, Amelia. It was amazing to see Mary and Jenn as parents and to get to hold a tiny little baby again. It was love at first sight for both Cale and I. It was my first time seeing him with a baby and I almost died when he held her and his first words were "Are you ok, sweetie?". I'm so lucky to be surrounded by so many great children and the best part is, we are all family. It's what life's all about....way to go, Guys! !